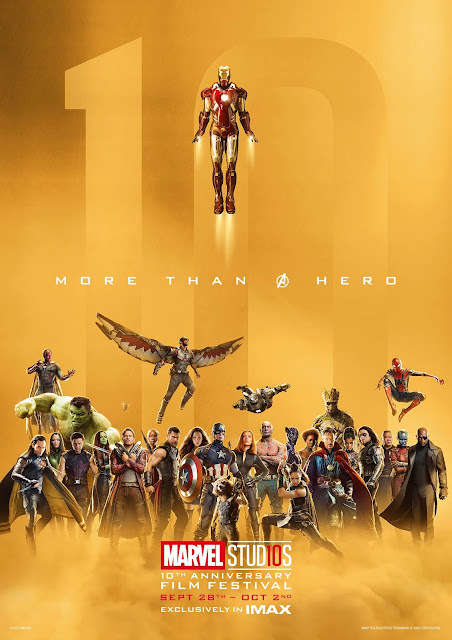 For a Thanos-sized anniversary celebration, the Marvel Studios 10th Anniversary Film Festival will, for the first time, exclusively present all 20 titles from Marvel Studios in ten IMAX® cinemas across the UK and Ireland for a marathon event of epic proportions. Over the five days of the marathon, all 20 films will be shown in their release order, with four films being screened per day. Those attending a screening at the participating IMAX cinemas will also receive a mini-poster of the 10th Anniversary artwork on a first come first serve basis, whilst stocks last. IMAX is the way fans can experience the Marvel Cinematic Universe to the fullest. Now, for the first time ever, all Marvel Studios’ films will be digitally re-mastered into the image and sound quality of The IMAX Experience® with proprietary IMAX DMR® (Digital Re-mastering) technology. The crystal-clear images, coupled with IMAX's customised theatre geometry and powerful digital audio, create a unique environment that will make audiences feel as if they are in the movie. The Marvel Studios 10th Anniversary Film Festival kicks off Friday 28th September, 2018 and will conclude on Tuesday 2nd October, 2018. For film timings and to purchase tickets, please click here.